ABVP volunteers and students protest against shutdown of MU. The Manipur University Academic Council today resolved to follow the guidelines of the UGC policy in the reservation of seats for admission to its post graduate courses. The decision was taken during a lengthy meeting of the council convened today at the university premises. 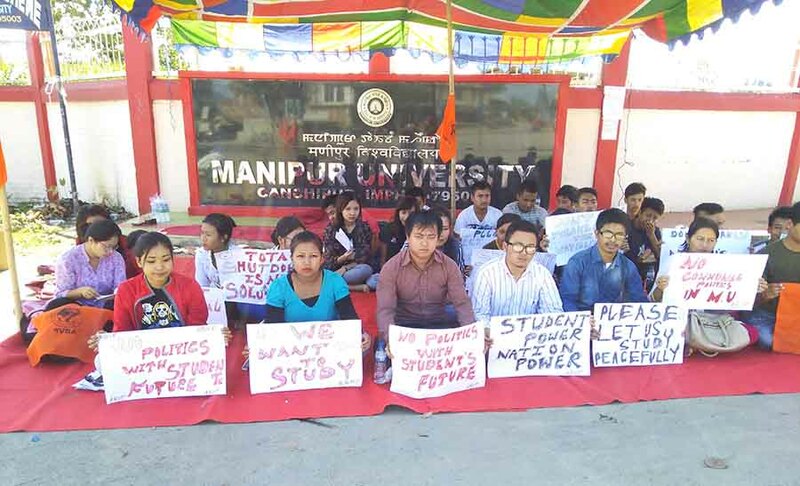 Amidst a raging controversy over reservation in the central university, the High Court of Manipur on October 3 passed an order saying that the university is free to take a decision on the matter relating to reservation so that the university may go ahead with the admission process for post graduate courses. A petition was filed by four individuals against the incapability of the university to conduct the admission process for post graduate courses as the reservation issue on whether the university should adopt the state policy or the UCG policy remained uncertain. The academic session for post graduate courses were supposed to commence in July, but it could not do so as the admission process was stalled. The uncertainty on whether to adopt the state policy or UGC guidelines for reservation has not only delayed admission to first year post graduate courses but also created an uneasy atmosphere inside the university campus. Following the controversy surrounding the reservation all classes of the university had been suspended indefinitely since October 4 after the recreational hall of the university was razed to the ground the previous night. As fallout of the entire episode, the then vice chancellor (VC) in charge of the university, M Dhaneshwar resigned from the post and prof Jekendra of Physics department took over the VC in charge post on October 4. Before becoming a central university in 2005, the university had followed the state reservation norms of 31 per cent for Scheduled Tribes (ST) and two per cent for Scheduled Castes (SC). The university continued to follow the norms till the 2008 session. However, with the implementation of the Central Educational Institutions (Reservation in Admission) Act, the university followed the reservation policy provided by the Act – 15 per cent for SC, 7.5 percent for ST and two per cent for the other backward classes (OBCs), beginning the academic session 2009-10. The change of reservation norms led to litigations and Manipur High Court directed two per cent reservation for SC, 31 per cent for ST and 17 per cent for OBCs in accordance with the Central Educational Institutions (Reservation in Admission) Act in 2012 and this policy was adopted during the academic sessions 2014-15 and 2015-16. After the court issued its directive, the UGC repeatedly directed the university to follow the central reservation policy and the academic council of the university decided to follow the policy adopted by the UGC.